Which is Your Favorite Elf? What is your preferred mental image of elves, or which version of elves in folklore appeals to you? I like John Wright’s return of elves from a higher order of being into the feared and menacing folk from ancient folk tales (from “before Tolkien and Gygax and even before Shakespeare’s A Midsummer Night’s Dream”) though, if I was to collect a miniature elf army or run a D&D campaign, my concept of elves would be the standard High Elf / Wood Elf construct. Over the years I tended to buy wood elf archers and swordsmen, which could also do duty as rangers with their green cloaks and hoods. J.R.R. Tolkien: Rivendell. No elves to be seen but this is definitely elvish territory. Out of all the stock fantasy races, elves are the one that are hardest to get a consensus on. Even Tolkien, who constructed a elven language and wasn’t afraid to include various humanoids and animals in his art, left elves out of his pictures (let me know if I’m wrong). For me, my concept of elves is dependent on the type of fiction I am reading. I recommend Jeffro’s Appendix N as he discusses multiple authors and their concepts of elves. Beginning from the “most ancient of elves” we learn the Cornish and Welsh version were “green-haired, white-skinned sea folk” Closer to John Wright’s pagan elves there are Poul Anderson’s elves, antithetical to Christianity and unable to touch iron or bear the sight of a crucifix, while Lord Dunsany’s elves live outside of time. From the back cover of a terrific album. JRRT depicted Elves in his “Father Christmas” art. The elves in my novels are a pre-human race that cannot handle iron but do not have the aversion to holy objects characteristic of the traditional Longevin. But then I set my novels circa 1500 BC, a hundred years before the birth of Moses, so not only is there no Christianity, there is no Mosaic Law. A very Dark world in some ways. I picture them much like the first illustration you displayed, the one by Sindaocllo. Now, tell me how I get the back cover of that album out of my head. It’s hard to believe Tolkein would have put asses ears on his high elves- Galadrial with ears like Bottom? Or a satyr? The Inklings wouldn’t wear it. D&D has rather done a disservice to elves — they often tended to become Spock-eared Aryan ubermensch types leading to complaints along the lines of “who else is sick of Nazi elves?” back in the day. And then you have what the Japanese have run with — that is where you find the sideways donkey ears culminating in abominations like the _Elf-san wa Yaserarenai_ manga. These days, elves kept as mysterious off-stage presences are my preference. Tend to agree with you. I hate the depiction of elves in Jackson’s movies. Give me the Rankin-Bass wood elves any day. Rereading The Lord of the Rings this past summer, I was impressed by how…off Tolkien’s elves are. He makes (subtly) makes it very clear that they aren’t human and don’t quite interact with the world the way we do. I prefer more old school fae. The Aelfinn and Eelfinn from The Wheel of Time are old school elf-esque (Jordan originally planned them to be more usual, boring D&D type elves). John Maddox Roberts has a really good Conan story, Conan the Champion, in which Conan travels to an alternate dimension and fights fae (Jordan certainly read this book, and may have edited it). Leigh Brackett gave us a very fae alien race in People of the Talisman. It suffers from the usual urban fantasy mundane-ness, but it’s hard to beat M.L. Brennan’s elves from the Generation V books for sheer visual weirdness. Plus she gave us the image of a vampire ripping an antler and a bit a skull right off of an elf. 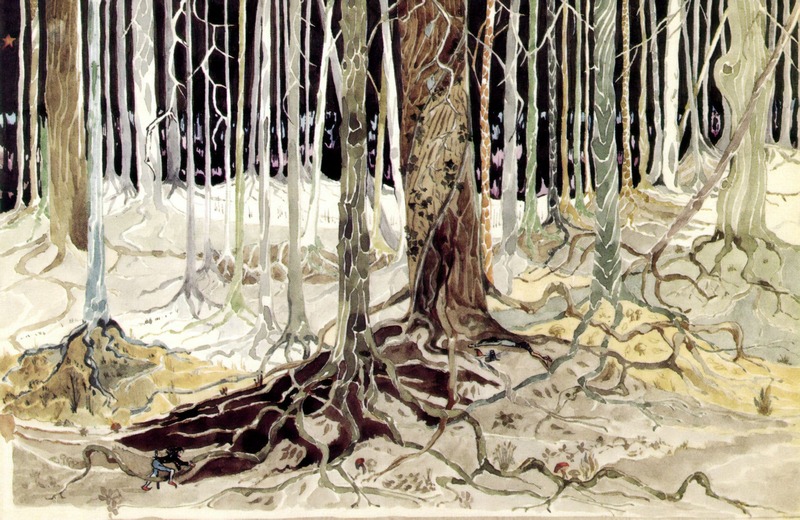 Tolkien portrayed two elves in his illustration of the forest of Taur-nu-Fuin (sometimes misidentified as Mirkwood); Beleg and Gwindor. That said, it’s basically indistinguishable from a human with pointy shoes, so not of much use. Anyway, having grown up with a mix of things like Warhammer, LotR, Warcraft and the like, I like my orcs & goblins green, my elves with long pointy ears, and my dwarves boozy Scots (but I repeat myself…). The other classic fantasy races I care less about. That said, I generally dislike it when lazy writers make them all psychologically human. D&D and Warcraft are particularly guilty of this in my experience… Terry Pratchett’s elves were rather better, but his dwarves were rather too close to humans. All this is something I’m having to deal with as well, given that I’m engaged in a fair bit of fantasy world-building. Making elven psychologies & such seem alien (and then working out all the consequences downstream from this) takes work though, so I can understand why say WoW quest designers and writers just write them as humans with pointy ears / green skin / whatever. The best portayal of elves I ever read were the Lunarians in Poul Andersens HARVEST OF STARS. Not elves, you say? Those Lunarians were merely biomodified humans adapted to low gravity, a modification which unwittingly changed their psychology to something more menacing, playful, catlike, noble, fickle, mercurial, you say? Read between the lines, friend. A tad obscure, but I am going to go with the elves of Earthdawn, FASA’s old RPG. I liked the lore of that Setting quite a bit. I couldn’t get my D&D group to try the game out so I started importing Earthdawn setting stuff into our game on the sly. Now I have We are Santas Elves from Rudolph playing over and over in my head. Tolkien’s Elves are definitely my favorite over all but I do think that Warhammer elves are underrated. The character of Alith Anar in particular is a lot of fun in my opinion. The elves in Larry Correia’s MHI are not the most traditional elves, but they may be the most fun to read. I always appreciated Scott R. Bakker’s “Nonman” version of elves from “The Prince of Nothing” series. He explored what happens when you live so long and have more memories than you can handle… Fresh take.